The founding spirit of the Internet is encapsulated in the following Enlightenment proverb, "I may not agree with what you say, but I will defend to the death your right to say it." Let's not lose sight of this principle, as obscenely wealthy corporations which have grown rich milking the Internet's openness, submit to thought-police who fear alternative information and dissent, and push ruthlessly for a politically correct online world. The "haters" are the bigots who hate the free circulation of dissenting information. In order to silence or obstruct the flow of information from this website, Zionist zealots libelously allege that RevisionistHistory.org is a "hate site." Jesus Christ taught that we are to love our enemies and do good to those who persecute us. We take His teaching to heart and advise others to do the same. Jesus shattered a pagan template of violence and revenge against those who oppose us. By doing so He overcame all of His enemies. Herod’s military might, his political dynasty and that of the Roman emperors and their vast armies, have all vanished. They were swept away by the Messiah of Israel who advanced the seditious belief that might does not make right; insisting instead that we learn to love our enemies and resist the temptation of retaliation and hatred. Romans 12:19. The gatekeepers are determined to demonize this writer with stigmas such as “holocaust denier” and “anti-semite.” These scurrilous libels are devices for intimidating potential readers, colleagues and supporters, and limiting the exchange of knowledge between a scholar and fellow truth-seekers. My authentic views are as follows: Judaic people suffered severe and unconscionable persecution during World War II, including mass murder at the hands of the Nazis. I deplore these crimes and the criminal Nazi ideology which inspired and directed them. At the same time, it is necessary to have the courage to point out the many parallels between Nazi ideology and the Israeli Zionist ideology which is engaged in the on-going dispossession and murder of Palestinians. Concerning “anti-semitism”: this phrase is supposed to denote racial loathing of Judaic persons, but is often employed to stigmatize those who dare to offer a narrative of Judaism which challenges the rabbinic narrative, or who dissent from the received opinion concerning Israeli actions in Palestine. Radical Judaic dissent from Talmudism and Zionism has largely been excluded from consideration. Consider that Norman Finkelstein and Noam Chomsky are routinely accused of being “anti-semitic.” This pseudo-scientific phrase is employed in many cases merely in order to gain advantage over political rivals. My work is based on love and not hatred. My targets are ideologies and theologies, not people. I will not be silenced. I have as much right to question and investigate Judaism, or any other “ism,” as anyone has to question Catholicism. Knowledge is not advanced by submitting to special immunities for one particular media-favored creed. It is not anti-Italian to point out iniquity in Renaissance or modern Catholicism; nor is it anti-Judaic to discover turpitude in the rabbinic Talmudic theology. If contemporary Catholicism is a form of oppression, then it is a liberating act to free Italians from its grasp. If contemporary Orthodox Judaism is a form of oppression, then it is a liberating act to free Judaic persons from Talmudic supremacy and tyrannical micro-management of their daily lives. My work transcends tribal atavisms and resentments. For example, in Secret Societies and Psychological Warfare I sought to deconstruct the command ideology of the Cryptocracy, while exploring an epistemology capable of inspiring higher consciousness by decoding the esoteric manipulation of thought patterns and the ‘group mind’ which impede our ability to transcend humanity’s perpetual squabbles and simian warfare. In the book They Were White and They Were Slaves I studied anew the circumstances surrounding so-called ‘white indentured servitude’ and discovered the prevalence of a far more onerous chattel enslavement of seventeenth century whites in America, and the dehumanized status of poor whites over the next two centuries. In Usury in Christendom: The Mortal Sin that Was and Now is Not, I argue that during the Renaissance, gentile usurers gained firm purchase inside the Roman Church by scapegoating rival Judaic usurers. I also demonstrate that early Puritans, far from being the stereotypical skinflints and shylocks of legend, denounced and opposed usury, even as Renaissance Catholic popes and prelates were granting permission for it and benefiting from its proceeds. My non-conforming research and writing do not fit simplistic Left/Right political or denominational categories, and because I violate taboos enforced by hysterical partisans, my name and reputation have been unfairly blackened. Truth-seekers with the curiosity and good will to look beyond the libelous opprobrium put forth by self-appointed thought police, will encounter in my writing, challenges to the consensus across a broad spectrum of revisionist history, Christian exegesis and Fortean epistemology. As Dr. Tony Martin, professor of African History at Wellesley College elucidated in his videotaped lecture "The Judaic Role in the Black Slave Trade," the root of anti-black racism is found in the Midrashic exegesis concerning Noah's son, Ham. 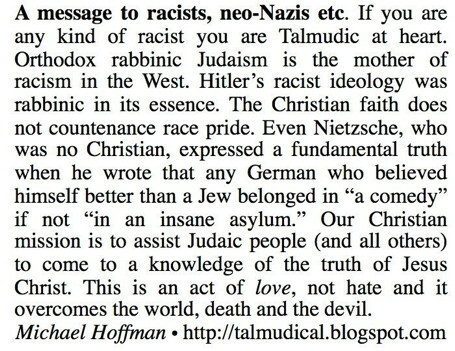 This insidious rabbinic doctrine in turn influenced Freemasons and masonic sympathizers within and outside the Ku Klux Klan (most notably Wesley Swift of "Seedline Identity"), who taught the specious dogma that there is a Biblical basis for anti-black racism, when in fact anti-black racism emanates from the rabbis of Judaism, including the "greatest of them all" Maimonides, and not the Patriarchs of the Old Testament. The supremacy of whites in America such as George W. Bush, Jeb Bush, Mitt Romney, Lindsey Graham, Ted Cruz and Paul Ryan, is synonymous with the rise of Zionist supremacy. I repudiate white supremacy, Zionist supremacy and all racial supremacies with every ounce of my being. "It is always the inclination of man to deny reality, to tidy things up, to wrap perception in the pretty party ribbon of partisanship and prejudice. It is the fate of the revisionist historian to forever wander the frontiers beyond party and dogma, cognizant of the original sin of his own subjectivity, but always struggling to see more, and give an account of what he sees with an utter disregard for the consequences of so fugitive a vocation. "Even at this juncture, information is not enough. For the key to getting as close to the truth as we can depends not on obtaining the most information, but rather, in honing our ability to detect fraud. Information is power, but it is not wisdom. "Revisionist history consists in the art of discerning fraud and the courage to publicly strip illusion, even when the whole world is clamoring violently for it." Privacy Notice Your information is never disclosed to a third party and your information is never shared, sold, traded or given away. No information is gathered about you by this website. Your privacy is guaranteed. We take this promise to you seriously. Thank you.